Some of you may remember that one of my goals for 2014 was to pay more attention to skincare and in turn feature it more on Nana Wintour. So far things aren't looking too shabby but it was about time a brand a little bit closer to home was shown some love. 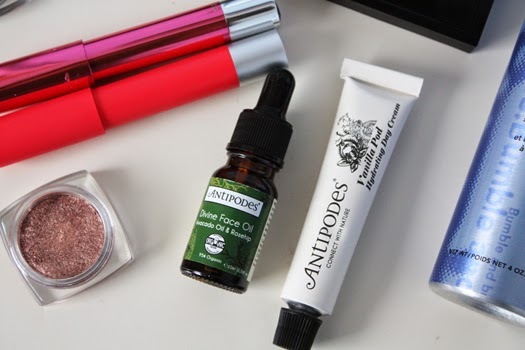 Antipodes are a New Zealand skincare brand who are known for their use of natural ingredients. Many of their products are in fact 100% organic so you know you're not putting anything nasty on your skin. Recently they released this mini duo of two of their fan favourites and, in a moment of dry-skinned despair last week, I promptly added this to my basket.. In this set you'll find the Divine Face Oil and the Vanilla Pod Day Cream. Now I'll be honest, I always find the thought of putting anything oil-based near my face quite frightful, and I still do. This oil however is so lightweight. It doesn't feel greasy or have that oily feel that I am not a fan of. It really does rehydrate and it's great to use if your skin's looking particularly dehydrated. The day cream is as Antipodes puts it, light but intensive. Again, this is incredibly nourishing and your skin feels so much softer afterwards. You can wear both these products under makeup and they won't interfere with its staying power. Both these products work well together but I've been alternating between them, depending on what my skin's condition is like each morning. If you're new to the Antipodes brand or your skin's in need of some TLC, this Moisture Boost duo is sure to be just what the skincare doctor ordered. The Moisture Boost Kit is limited edition so be quick if you want one! *Have you tried any products from Antipodes? This looks like the perfect duo to take on a long haul flight. I used to be adverse to oil directly on the face too but rosehip oil is amazing and got me over that fear. It'd be perfect for a long-haul flight actually. They're very travel friendly sizes. I have been trying to up my skincare game this year as well, and I love the sounds of the vanilla day cream. Thanks for sharing!